Commuting is part of nearly everyone’s day. It should be an easy part, a comfortable part, and so reliable that it’s the part you barely need to plan. You deserve to have this time back, to start up and wind down. That’s why we’re bringing back $6 flat fare uberPOOL rides for commuting, for a limited time. Now with extended hours, 7-10am and 4-9pm, and in an expanded area*. Get picked up and dropped off at your door for less! uberPOOL enables people going in the same direction at the same time to share the journey. This means more butts in fewer cars, cheaper rides for more passengers, and less congestion on the road. So by commuting, it’s helping more than just your commute. 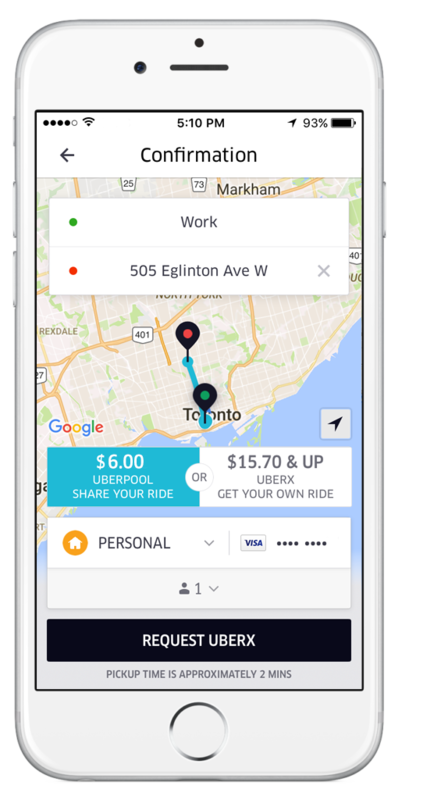 Learn more about uberPOOL in Toronto here. Picking up other riders along your way normally adds a few minutes to your trip. Planning ahead and leaving a little earlier will help make your uberPOOL experience stress-free. Your uberPOOL driver can only wait up to 2 minutes after arriving at your pickup location, so please be prompt. We don’t want to leave without you but also can’t keep your co-riders waiting. New pickups may be added to your route over the course of your trip. Your driver will be directed to this next pickup automatically. Consider chatting about the weather or your favourite restaurants, or what’s happening in the city. Remember, for many commuters, the time spent riding in an Uber is a rare moment of me-time so silence is often welcomed too. By all means, enjoy a quick bite on your uberPOOL commute. Let’s be sure it has a cover or a wrapper, and is mess and aroma-free though. We love a good fish taco as much as you, but your uberPOOL is not the best place to eat one. There’s a lot that goes into planning your route—even before you hop in. Unplanned extra stops disrupt the route for everyone, so please refrain from negotiating the order of drop-offs with your driver or co-rider. We got this! Commuting with a friend or colleague? No problem! When making your request, make sure to change your party number from 1 to 2 so there is enough room for everyone. If you’ve questions or concerns about your ride while on a trip, reach out to us through ‘Help’ in your app instead of taking it up on the spot. We’ll sort it out for you pronto to save you the hassle. The truth is, we all want to spend less on transportation, we all want what’s best for the environment, and we all want a relaxing, comfortable commute. So why not add uberPOOL to your weekday routine?